On the outskirts of the city, a young orphan boy, Lark, is forced to scavenge the muddy flats of the river for treasure in order to survive. When he finds a magical box that cannot be opened, his life changes forever. Lark soon learns that he is destined to battle the Capposeign – the corrupt and evil theocracy that rules the city of Perous with fire magic. However, Lark soon discovers that he has his own sort of magic, earned through a childhood spent in the water. He must quickly learn how to use his power or die trying. In his quest to take down the Capposeign, Lark must ally with a witch, an artist, a revolutionary, and a strangely familiar and beautiful courtesan. Facing the powerful fire mages will push Lark and his friends to the very limit as they fight to save the city but will their efforts be enough, or will it all go up in flames? You can read a sample of Mudlark on the Momentum books site! A hundred years ago, the magic-users of Perous relinquished their magic to one man to save the land from an endless winter. The Capposeign Fire mages were not happy with giving up their power, however, and took it back forcibly, taking over the city and keeping the other magics of Earth, Air and Water locked away in a box. Now, a mudlark boy finds a mysterious box in the mudflats along the end of the river. He doesn’t think much more of it as he is literally grabbed from the scavenger’s life. He is given the name Lark and is taken into a company of artists and free-thinkers who are preparing to instigate a rebellion against the Capposeign rulers and take back control of Perous city. Lark and his strange wooden box will eventually play a key part in the rebellion and the return of the other magic to the people. Alongside Lark’s journey from young boy to young man, there are a host of other characters throughout this story – the young girl Fleur learning the courtesan’s trade on a pleasure barge, the earth witch and mother figure Magda, the charismatic ladies (and man’s) man Azule… At times the sheer number of named characters was overwhelming and I occasionally had trouble remembering who each person was, but by the end of the story each of the main characters were as familiar as friends – fabulous character writing in Chris’ debut work! 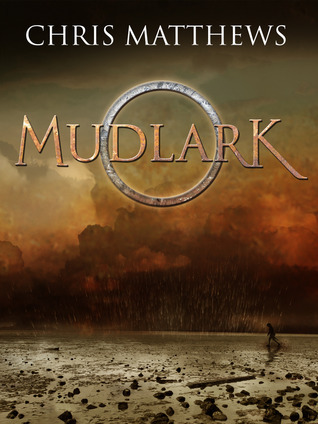 Mudlark incorporates a guy-girl-guy love triangle of an unusual type for most high fantasy, where the mutual love interest is one of the guys in the triangle, and the two guys fall in love. It’s quite romantic and a very natural progression – this isn’t an LGBT-targeted book in particular, it just happens that some of the relationships are of that nature. Just like real life, in fact! I was a little confused with the nature of the magic in this world – all magic except Fire magic was supposedly taken away during the Relinquishment, but the adherents to each deity still have some ability to call up mists, become invisible, and other various skills. Is that not magic? That wasn’t explained so well, but apart from that, the magic system seems quite complex. Each spell costs energy and gifts are bestowed by the four deities. Even though this is a stand-alone story, I’d be interested to know whether there was more planned for this world, just to see the magic in action at full power. The pacing in Mudlark is just right with action interspersed very well with the planning and travelling scenes, and the travelling parts cut down so there wasn’t days and days of horse riding or walking described. I found it very difficult to put this one down – very highly recommended to those who enjoy a story of revolution and the desperation of a repressed people. Despite having such a heavy subject matter and dark themes such as torture, prostitution and abuse, the overall story remains optimistic and left a smile on my face. A Londoner, Chris came to Australia as an unskilled migrant and finished up working as a lawyer, which she thought she’d like, but didn’t. Instead she decided to write the sort of speculative fiction book she would have liked to read when she was a young adult. One where the women aren’t ‘damseled’ and the gays don’t all end up dead. 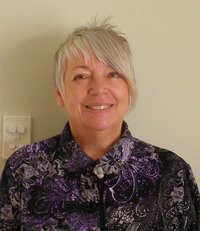 She lives with her partner of many years, Maria, and between them they have three children and two grandchildren. She is a self-proclaimed sports tragic who supports Tottenham Hotspur, Port Power, and, because it is good to support at least one team that wins games, Barcelona FC. On a gayer note, she is addicted to Eurovision. This sounds very different from the type of books that I normally read, but it still sounds like one that I might just enjoy. After reading your review, my interest is even more piqued! And, by the way, that cover! THAT COVER!!! Awesome in so many ways!